The Christmas period is full of random problems so I tend to lean the video collections to get me through. This leaves me lots of time to look through the old collection of films and remind myself of some great films to revisit. Michael Douglas as a dinosaur in a modern world, he just will not take any unneeded crap from anyone. The man who has had enough ; one day he flips, and gets out of his car to go on a one man quest to see his child, and woe betide anyone who gets in his path. The excellent support cast make this a heady mix of action, drama, and tension. This was once destined to be a straight to DVD movie, but was saved by interest from the actors themselves. Michael Douglas recognising the film’s potential. This is Samo Hung at his best. 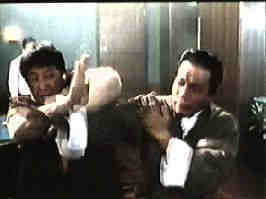 This 1989 martial arts extravaganza epitomizes why Hong Kong flicks are usually better than their western counterparts. The above average plot (for a Martial Arts film) is helped by the choreography and acting. If you see this, make sure that it is in Widescreen , and you have the subtitles. The jokes and subtleties are lost in he dubbed versions. Dustin Hoffman plays the brother of an American Secret Agent embroiled in international espionage. He gets court up in the battle for pillaged diamonds, and a tense edge of the seat thriller unfolds. The acting from the three leads ; Hoffman, Schneider, and Olivier is excellent. Watch out for the dentist's chair, that’s got to' chafe. A blend of amazing effects, smart dialogue, and kung fu chicanery ; the first film in a long time where the sci-fi plot does not over dazzle the acting. Keanu Reeves and Laurence Fishbourne star in a film where the Alice in Wonderland, coming of age sub plot are played to perfect perfection. Ground breaking use of 3D still camera technique with a training schedule of four months that turned the stars into Ju-Jitsu dervishes, make this a must see. "Everything is not as it appears."